Oboist and English hornist Cat Cantrell is an avid orchestral and chamber musician based in New York City. Raised in an Air Force family, she is most comfortable as a nomad travelling wherever music takes her – she is delighted music brings her to the Tucson Symphony Orchestra as 3rd oboe and English horn. As a Britten-Pears Young Artist 2014, she travelled to the United Kingdom to perform in the chamber orchestra for Benjamin Britten’s Owen Wingrave at both the Aldeburgh and Edinburgh Festivals. In the U.S., she has participated in the Brevard Music Festival, Immanuel and Helen Olshan Texas Music Festival and Eastern Music Festival. As a Britten-Pears Young Artist 2012, she was thrilled to tour Europe with the Aldeburgh World Orchestra including performances in Munich, the Royal Concertgebouw in Amsterdam and culminating in a concert at the BBC Proms in Royal Albert Hall during the 2012 London Summer Olympics. Cat has also had the pleasure of joining the Manhattan Symphonie on tour in China and the Tel Aviv Cantorial Institute Men’s Choir Tour of the U.S. in 2012. An active freelancer, she performs with a wide range of groups in and around Tucson and NYC including the Tucson Chamber Artists, Bergen Symphony (NJ) and the Gotham Winds (NY). Cat Cantrell earned a Master’s of Music from Mannes College the New School for Music studying with Sherry Sylar, Associate Principal of the New York Philharmonic. 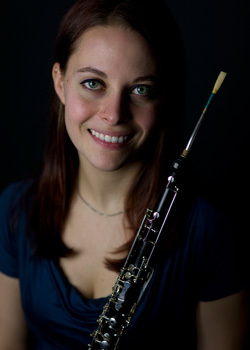 She holds a Bachelor’s degree in Oboe Performance from Florida State University, studying with Dr. Eric Ohlsson. Upon completing her MM in 2012, she was awarded the James E. Hughes, Sr., Memorial Performance Award. As an ally of new music, Cat was an original member of MACE (Mannes American Composers Ensemble). The creation of composer Lowell Libermnn, MACE exclusively performs works by living, American composers. She has performed as a member of CIRCE (Composer in Residence Chamber Ensemble) at Mannes and the Brevard Festival’s new music ensemble itch. She has worked with C4, the Choral-Composer-Conductor Collective in New York City performing alone with choir. She has participated in the premieres of a number of new works, including the 2011 New York premiere of Elliot Carter’s Flute Concerto, with the composer in attendance. Excited about all forms of music, she regularly performs outside the classical genre and concert hall on multiple woodwinds – including performances with musical theatre groups (such as the Montclair Operetta Club, Bergen PAC and Pleasant Valley Productions) and with the JouJou Jacquettes Philharmonic Orchestra (a backup band for the World’s preeminent DragDivaConcertPianist). Beginning fall 2014, she can be heard in recital with Terry Barber, internationally performing countertenor and past member of Chanticleer. When not absorbed in music, she likes to bake, explore the city and play with her cat, Nütella.